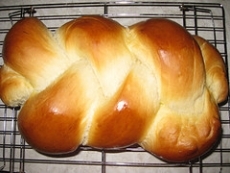 Have you made Challah Or Koilitch ? Cooking Time: 1 hours and 10 min. 1. Method: Combine the yeast and sugar in the mixing bowl of a table top mixer and dissolve in 1-1/4 cup tepid water. 2. In a large mixing bowl, sift together the flour and the salt. 3. Add the eggs and melted and cooled butter and 2/3 of the flour mixture to the yeast mixture. 4. Mix at speed 2 for 2 minutes, then add the flour up to the point that the dough leaves the sides of the bowl. 5. Grease large bowl and place the dough in it turning to grease the top. 6. Cover with a kitchen towel. Let rise in a draftless warm place for approximately 1 hour. 7. Take 2/3 of the dough and make a braid with it about 1 foot long. 8. Place it on a lightly greased cookie sheet. 9. Put kitty-corner, squarely in the middle. Brush braid with the egg yolk. 10. Take the rest of the dough and make a smaller braid only 10 inches long. 11. Take the side of your hand and press firmly along the top of the larger braid (to keep smaller braid in place as it is baking). 12. Place smaller braid on top. 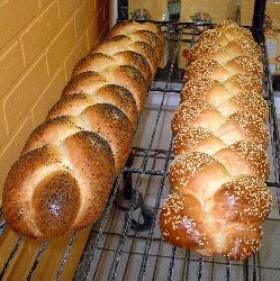 Brush the top braid with egg yolk and sprinkle liberally with poppy seeds. 13. Let rise in a warm place again, about 40 minutes; don't let it rise too much. 14. Bake in preheated oven at 375 degrees F for 40 to 45 minutes. 15. Check after about 25 minutes to see that it isn't getting too dark. 16. If it is, place a piece of foil over it for the balance of the baking time. This recipe contains potential food allergens and will effect people with Wheat, Egg, Yeast, Butter, Gluten, Natural Sweeteners, Poppy Seed allergies.